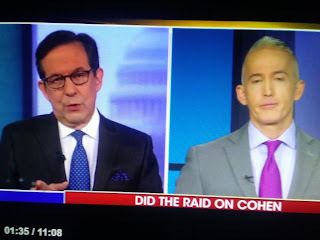 I couldn't believe the garbage that came out of Trey Gowdy's mouth this morning on Fox News Sunday. The Daily Beast reports a top House Republican on Sunday defended the FBI raid on President Donald Trump’s longtime personal attorney Michael Cohen’s home and office last week, as the president continues to assail what he views as a breach of attorney-client privilege. Rep. Trey Gowdy (R-S.C.), the chairman of the House Oversight Committee, argued that Deputy Attorney General Rod Rosenstein—who is overseeing special counsel Robert Mueller’s investigation and has come under heavy criticism from Trump allies—was right to authorize the raid, and that Mueller was just in referring the matter to prosecutors in New York.